Broken down to its simplest level, the philosophy of Nihilism can be summarised as nothing having meaning; and it would only be in a meaningless world that action games – the realm of active engagement and quick reflex – and idle clickers – focused on almost no engagement and reacting potentially days later – could meet. And yet here is Nongünz, where all three of these elements do indeed meet. I will admit it was the game’s graphics that drew me to the display at Rezzed first of all. 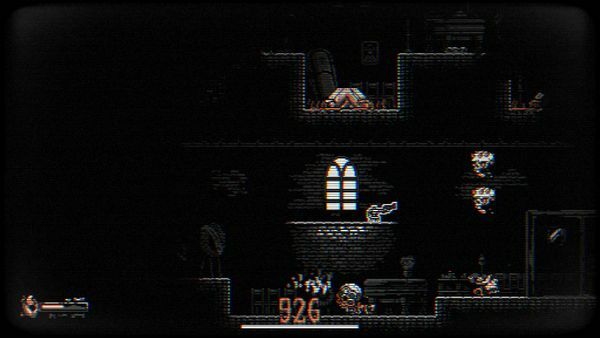 Finding a distinct aesthetic within an indie developer’s budget is a challenge that every game will have faced, with many successes… and Nongünz still stood out to me. It takes a minimalist approach to colour – black, white and orange – and applies it to busy displays of detail, often with solid outlines to the sprites. Simply put, it looks like an old Spectrum game, with the graphical fidelity enhanced for sharper resolution and no colour clash – and I say that flatteringly, as it really stood out on the show floor for it. Death is a running theme of the game, not least in those you cause. The core of the game is a run-and-gun platform shooter, blasting your way through monsters in a building with randomised layouts from session to session. The pace is high, personal deaths were more common than finding escapes, and generally the learning curve was a steep one, offset with passive buffs found semi-regularly in boxes for that extra edge. However, outside the building – itself appearing to be a derelict hospital or institution of some kind – were more links to death (and life surrounded by it), your refuge from the shooting being a graveyard that is also home to various helpers and general workers supporting your efforts. As you gain points within the levels, you can escape to spend them back at a gun memorial in the graveyard and so buy better weapons ready for the next run (though these will only last for a limited amount of use). 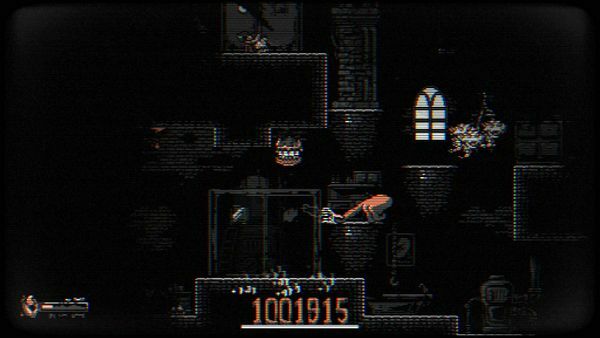 Except if you’re paying attention you’ll see your score is also going up regardless, as the workers in the graveyard are also generating a score for you, even if it is short of what a shooting spree through the game will get. And if you’re paying even more attention – which in this case I wasn’t as it needed to be pointed out to me – even just firing your gun, regardless of hitting anything will also add a point to your score, getting you closer to being better geared one bullet at a time. Here’s where the clicker element comes in, with a passive score (equivalent to the usual DPS effect) which could help do a lot of work for you, and the suggestion that the number of workers can be greatly increased for faster score build-ups (though this itself wasn’t seen in the session I played). The developers, Brainwash Gang, were on hand to point out that while the themes of life and death and Nihilism were in there, the game itself tries not to force these as points needed for playing – much like implied lore, it there to take or leave as you choose. The sense of the morbid does come through – the loading screen is a rotating skull, for example, which is pretty par for the course these days; this is in contrast to the game’s trailer however, which juxtaposes real footage of war with gameplay, and even as a gamer who has inflicted pretty much every fatality possible on enemies in games over several decades, the mixing of real violence with gameplay feels like it is stepping heavily on an ethical line. That all said, the game itself can be pretty much pick-up-and-play, with various critters trying to swarm you. But while the pace of the game is pretty fast, it’ll be interesting to see if the passive elements of both score production and stat boosts gained inside can give a step up to players not ready for something that keeps the challenge level as well as the look of a genuinely old-school title. Nongünz is due for release in the second quarter of 2017.